Minorities face greater discrimination in Georgia than in most other states when it comes to casting a vote — according to a WhoWhatWhy analysis of a recent federal report, as well as the observations of voting-rights experts. The report tabulates voting-rights lawsuits since the Supreme Court ended the requirement in 2013 for certain states and other jurisdictions to clear any proposed changes in voting with the federal government. It also accounts for “potentially discriminatory measures,” like closing or changing polling locations, in each state. 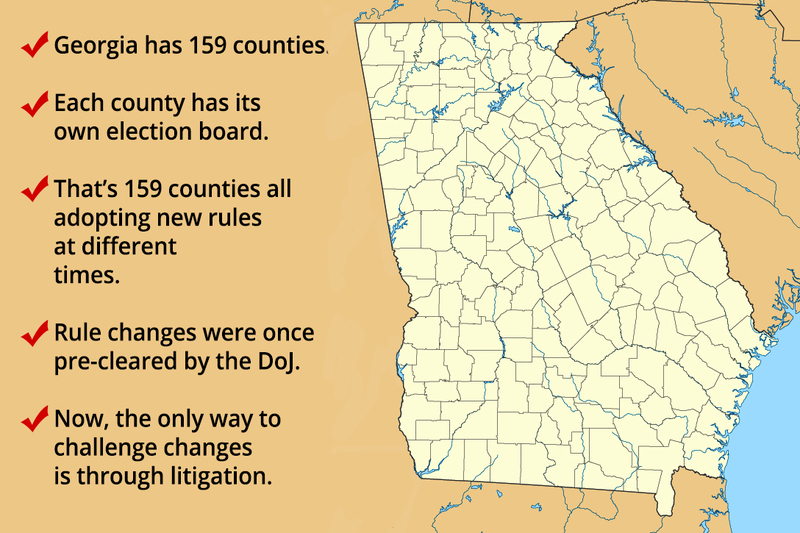 Georgia appears to have been the target of more lawsuits than most states, and it has put in place a wider range of the measures listed. 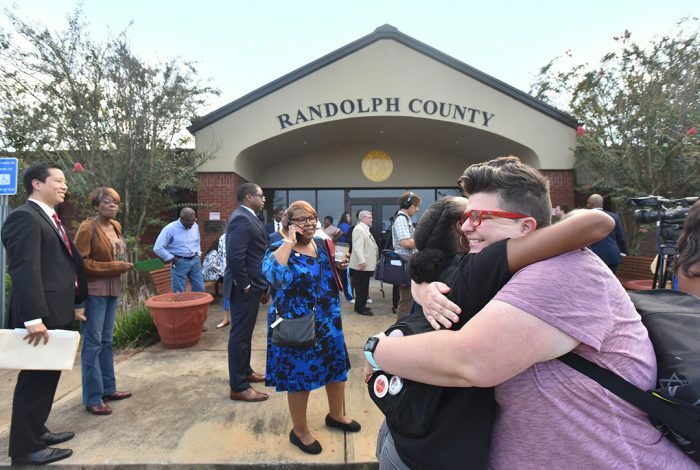 “[Georgia] has taken the position to make it more difficult for people of color and poor people to vote,” says Julie Houk, an attorney for the Lawyers’ Committee for Civil Rights Under the Law who has extensive experience in the state. The US Civil Rights Commission recently issued the report, “Assessment of Minority Voting Rights Access in the US 2018.” Among its conclusions: Five years after the Supreme Court’s decision in Shelby v. Holder, successful lawsuits stopping discriminatory actions under Section 2 of the Voting Rights Act — which prohibits discrimination — have increased by a factor of four when compared to the five-year period prior to the decision. The number of such cases in Georgia is among the highest nationwide, according to the report and expert analysis. Prior to 2013, nine states — mostly in the South — and 56 counties and towns in other states, were covered by what was known as Section 5 of the Act. Now that these states and other jurisdictions don’t have to clear proposed changes with the federal government, private groups have increasingly had to turn to the courts to stop practices such as implementing voter ID laws, cutting early voting, and redrawn maps that limit minority representation and participation. The report shows at least four successful Section 2 cases in Georgia since 2013, placing it behind only Texas, which had five. Other cases are still in court. Georgia’s secretary of state vigorously disputes the notion that the state in any way infringes on the voting rights of minorities. “Secretary Kemp has always prioritized secure, accessible, and fair elections for all Georgians,” wrote spokeswoman Candice Broce in an email. Brian Kemp is also the Republican candidate for governor in Georgia’s midterm elections on November 6. Broce noted that some of the cases mentioned in the report involved counties, not the state — while others not mentioned have been dismissed. In other words, the state is not responsible for some of the policies and procedures that have been the subject of litigation, and not all litigation has been successful. Also, voter registration and turnout have increased — both overall and among minorities — during Kemp’s term in office, which began in 2010, Broce said. Jonathan Brater, attorney at the Brennan Center for Justice at the NYU School of Law, gave the state credit for implementing a version of “automatic voter registration” — one which prompts people who seek driver’s licenses to opt out of registering to vote, rather than asking if they want to opt in. This has led to increased voter registration in the dozen states that have adopted the practice since 2015. At the same time, Brater noted, “Georgia has become more competitive [politically]” in recent years, which also tends to drive registration and turnout. But in spite of any such increases, the report’s “conclusions make a lot of sense … It’s the difference between being covered [by Section 5] and not being covered,” said Ben Thorpe, an Atlanta-based attorney who has worked with Common Cause of Georgia on voting-rights cases. Houk called the report’s conclusions “credible.” She has seen an uptick in Georgia and elsewhere not only in cases under Section 2 of the Voting Rights Act, but also in cases under Section 203, which requires jurisdictions with minimum populations of voters who speak languages other than English to produce materials in those languages. She also has filed National Voter Registration Act and constitutional cases. The report refers to “successful” Section 2 cases, which include cases in which the court determined that the section of law was violated, or in which an injunction or settlement was reached. But it notes that the database the commission used to gather the data does not include all cases, and lists two Section 2 Georgia cases in a footnote as examples of additional cases. Houk is also currently involved in a Section 2 case in Gwinnett County, alleging that current district lines prevent minorities from electing representatives to local boards. She also worked on a successful National Voter Registration Act case that arose from the Congressional District 6 runoffs in late 2017. As a result of that district court decision, Georgia cannot prescribe voter registration cutoffs in federal elections and cannot cut off voter registration longer than 30 days before an election. She pointed to a recent district court decision by Judge Amy Totenberg ruling that it was too close to Georgia’s upcoming midterm elections to switch to paper ballots, but that the state had its “head in the sand” when it came to protecting cybersecurity, the issue at the heart of the case. 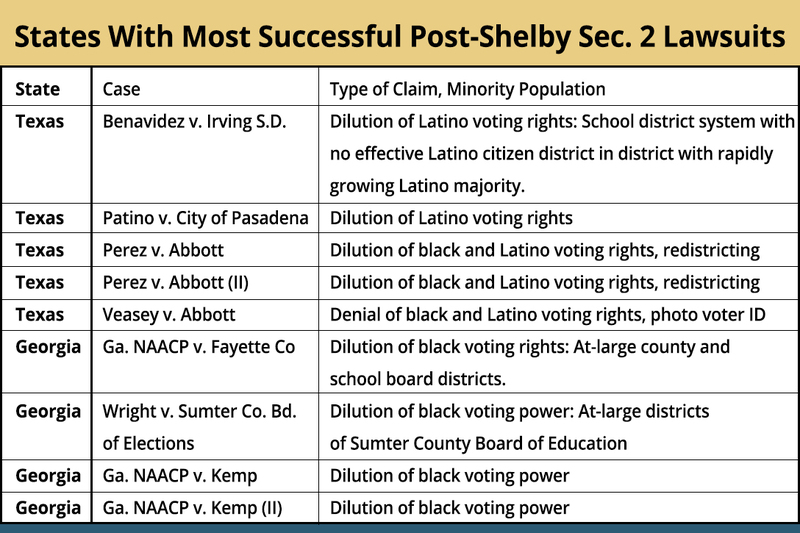 The Civil Rights Commission’s report, and voting-rights experts consulted by WhoWhatWhy, also pointed out that Section 5 clearances prior to the Shelby v. Holder decision differed from “successful” Section 2 cases, in Georgia and elsewhere. Previously, a state could not make any changes without first obtaining approval, but litigation can take years, during which time those changes have already been made — unless injunctions are issued — and elections continue to be held. “Depending on the timing of each case … even if it ultimately turns out that the litigation is successful, you can’t undo the discrimination and disenfranchisement that took place in the previous election,” said Jonathan Brater, attorney at the Brennan Center for Justice at the NYU School of Law. The commission’s report also includes data on what it calls “potentially discriminatory measures that have been put in place” in the nine states formerly covered by Section 5, as well as in all other states. The measures: requiring voter ID; requiring documentary proof of citizenship; purging voters from the rolls; cutting early voting; and moving or eliminating polling locations. Georgia is the only state with all five ticked off. Related front page panorama photo credit: Adapted by WhoWhatWhy from Georgia counties (Alexrk2 / Wikimedia – CC BY 3.0) and sticker (Ezra Freelove / Flickr – CC BY-NC-SA 2.0).